Happy 8th Birthday Miss Maddy!!! 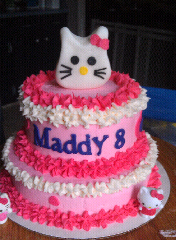 This entry was posted in Uncategorized and tagged Birthday cake, girl birthday, Hello Kitty, Mama Bird's Nest. Happy, Happy 40th Birthday to one of my bestest buddies ever!! Annette and I have been friends for like 15 yrs! Here is the PURPLE cake I made her. Purple is her fav color! It is vanilla, chocolate & cherry almond in flavor with a cream cheese butter cream frosting! Thanks again, to J Panache Photography for snapping a pic of the cake!! This entry was posted in Uncategorized and tagged Birthday, Birthday cake, Birthday Cakes, Mama Bird's Nest. This is the 2nd Mario cake I have made and although, I thought the first one turned out cute, I do think I am getting better! Practice makes perfect. This entry was posted in Uncategorized and tagged Birthday, Birthday cake, Hickory Cake Baker, Mama Bird's Nest, Mario Bros Cake. Another super fun birthday bash for my boy Kamden! He turned 6 and loves some Scooby Doo!! His Mom came up with an adorable scavenger hunt to “find the cake” and all the kids loved it! They also wrapped each other up like Mummy’s! This entry was posted in Uncategorized and tagged Birthday cake, Birthday Cakes, Mama Bird's Nest, Scooby Doo Birthday cake. How stinking cute is this Mario Bros cake?! I just love the clouds, the red mushroom and most of all MARIO, who I made out of fondant! This was a super fun cake to make!! This entry was posted in Uncategorized and tagged Birthday, Birthday cake, Birthday Cakes, cakes, Mama Bird's Nest, Mario Bros, Mario Bros Cake. Here are some of the recent cupcakes and cakes I have baked and wanted to share. Pink cupcakes Happy Birthday E! This entry was posted in Uncategorized and tagged Birthday, Birthday cake, Birthday Cakes. Miss Mag’s is turning 2 and having a Fairy Party. 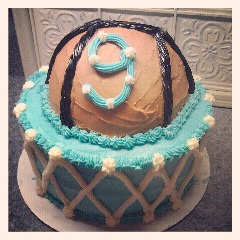 Her sweet Mommy wanted to use the invite as the inspiration for the chocolate cake. I just LOVE this girlie girl cake!! This entry was posted in Uncategorized and tagged Birthday, Birthday cake, Birthday Cakes, cakes, Fairy Cake, Mama Bird's Nest, party.